The heart is such a sweet representation of love, as well as everything that comes with it. 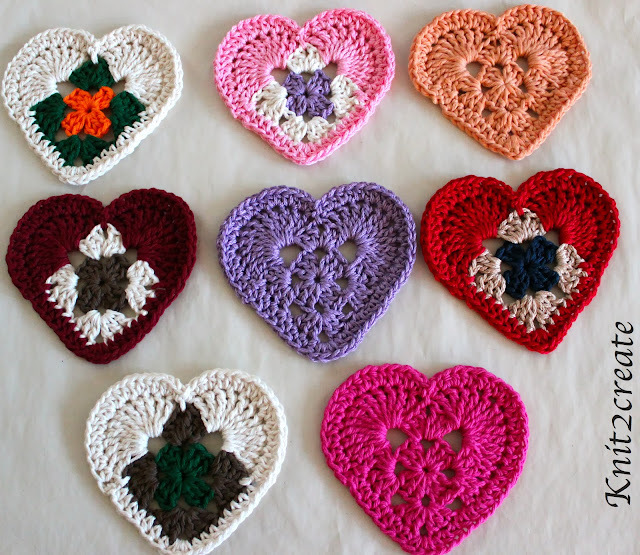 And with Valentine Day being just around the corner it is only appropriate to express that love with a beautiful Granny heart. 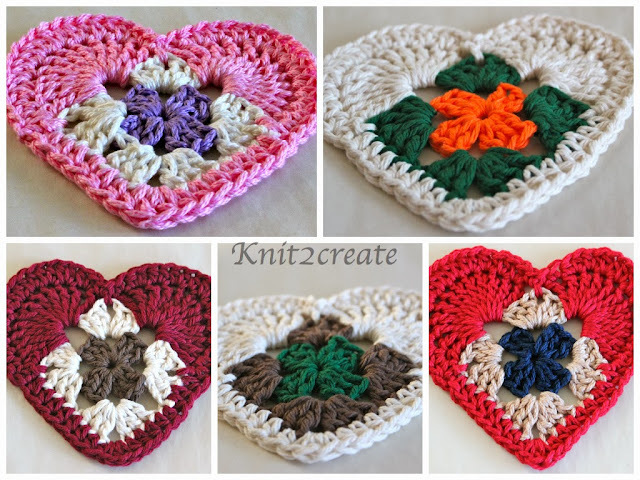 I wanted to crochet a non traditional heart using my favorite granny stitch with colors other than red, cause love comes in every color, doesn't it? 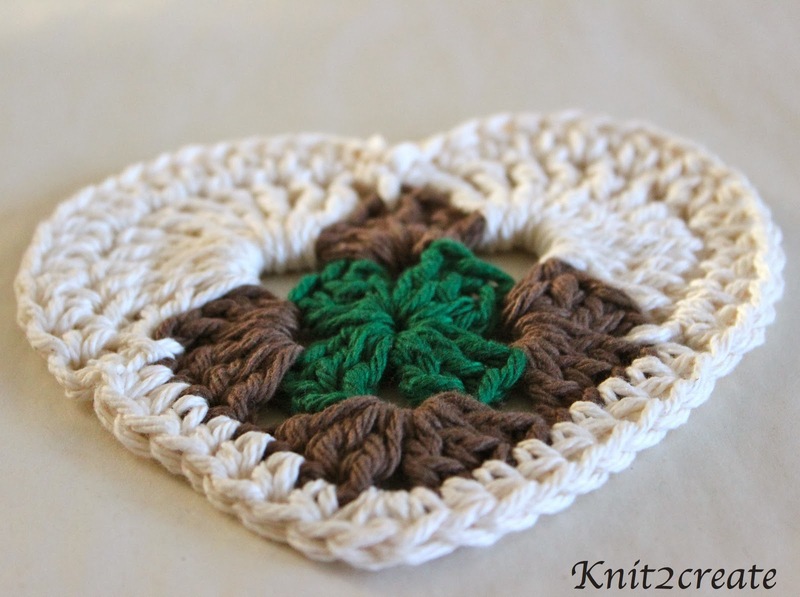 I used 3 different colors (Green,Brown & Cream) of worsted weight yarn with a Size H hook. The size of the yarn and hook only determines the size of the heart. 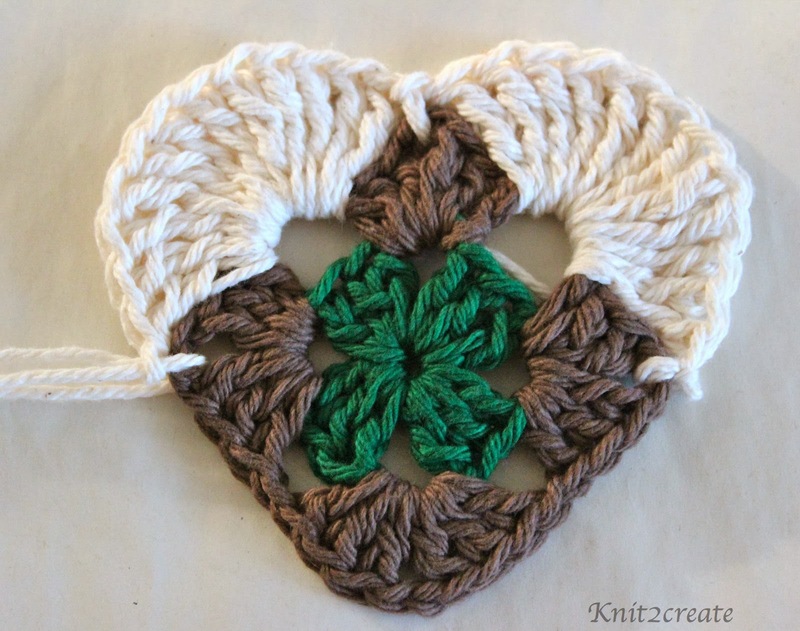 Bigger size of yarn & hook makes a bigger heart and vice versa. With worsted yarn & size H hook, my heart measured at 5" wide x 5" height at the longest point which is perfect size for a coaster. I have written down the pattern at the bottom of the post and included the picture tutorial here. 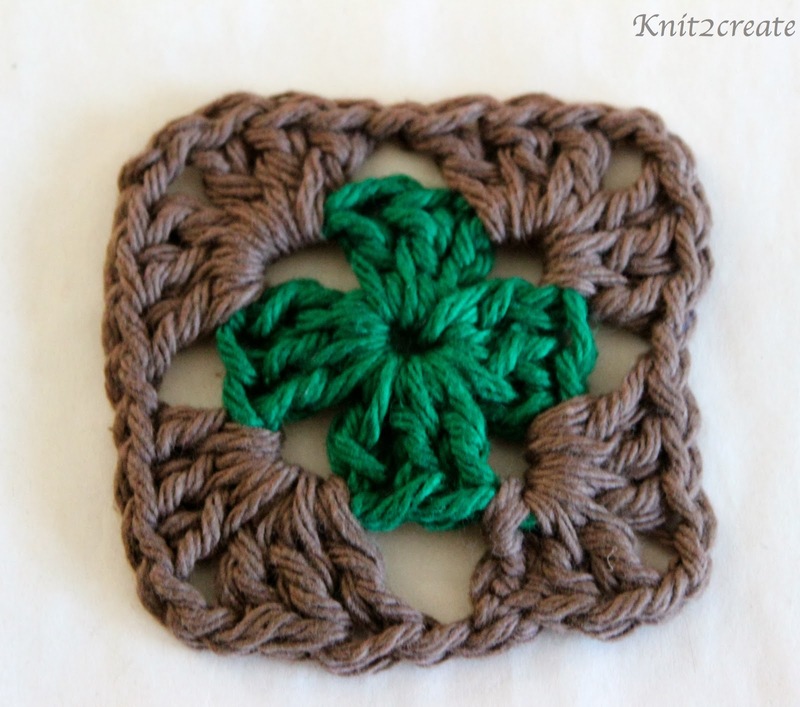 I started out with first round of Granny square with the Green color. Second round is done with the brown color . Fill two of the adjoining Ch 1 spaces with 12 Triple crochet's each with the Cream color . Finish off the rest of the heart with hdc's and Wallah! There's your Granny heart. 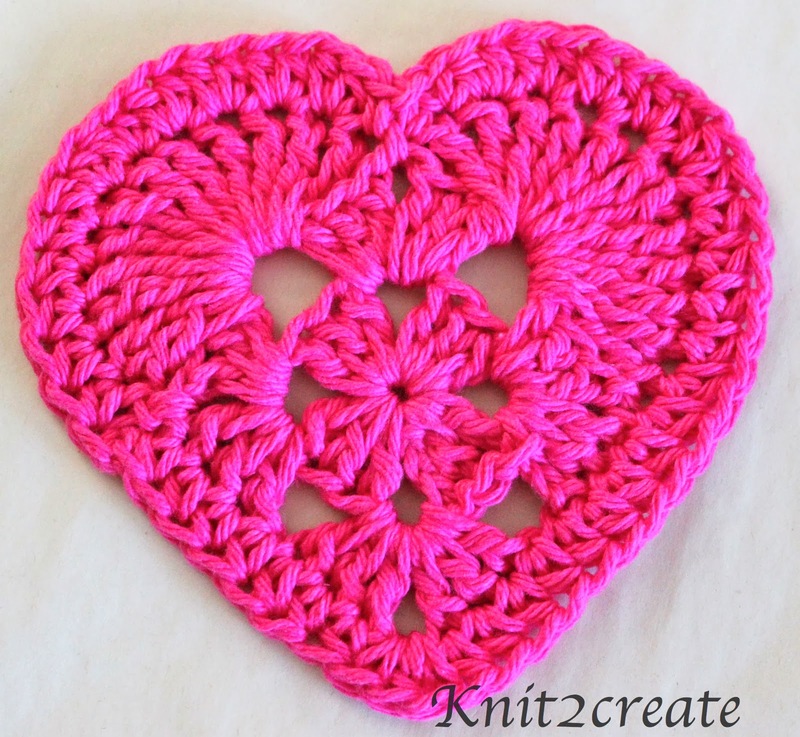 Now, you could make this heart with 1 color if you want or 2 or 3 as I did. More colors add more life and more pizzaz . 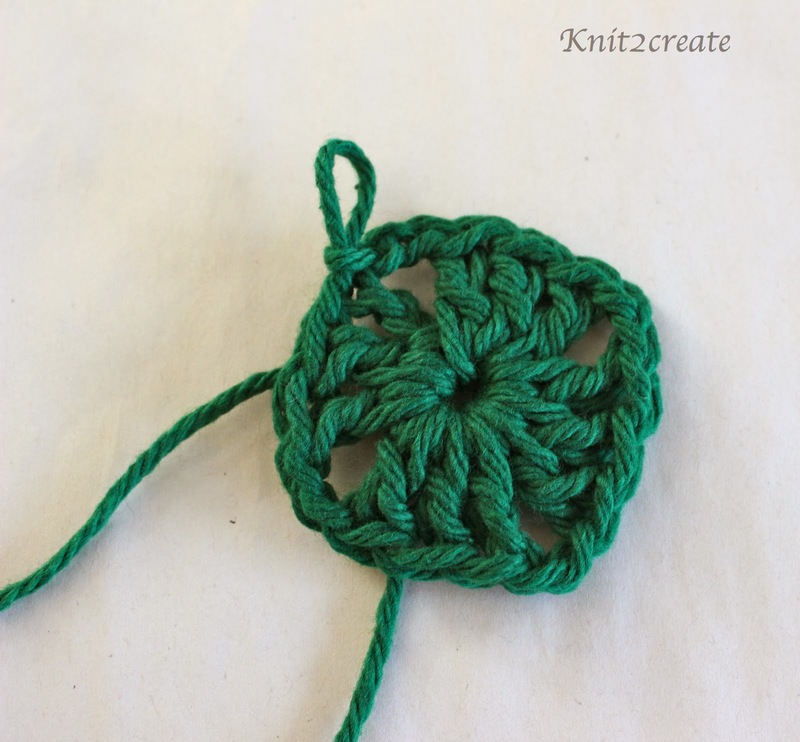 This is a quick crochet project and a great project for scrap yarn. This would make a great coaster, but make sure that you use 100% cotton yarn for that cause wool will melt with the heat. Here's pics of the other hearts I crocheted using the same pattern. Chain 4, join in round with a slip stitch in first chain . Round 1. Chain 3 (counts as first dc), 2 dc in circle, *chain 2, 3 dc in circle, repeat from * twice more, chain 2, join with slip stitch in top of starting ch-3. You will change to second yarn at this point. Slip stitch in the next ch-2 space, chain 3 (counts as first dc), 2dc in same space, ch 2, 3 dc in same space, *ch 1, 3 dc in next space, ch 2, 3 dc in same space, repeat from * twice more, ch 1, join with a slip stitch in top of starting ch-3. You will change to 3rd yarn now. *ch 2 12 trc (triple crochet) in next ch-1 space, slip stitch in next ch-2 space, repeat from * once more. ch 2, hdc in next 8 sts. You should be at the ch 2 space at bottom edge of the heart. (Hdc dc hdc) in ch 2 sp, hdc in next 15 sts. All Contents are Copyright of @Knit2Create . Please do not reproduce any of these pattern or distribute them and claim them as your own. If you want to make items to sell from my patterns, Please credit me with the design, and link back here if you are selling items online.